Sports Climbing : This is the most popular way to start your climbing journey. Walls are mounted across the world with set standards and faces with different difficulty levels. IMF has a world class wall in Delhi that many climbers use as a favorite practice ground. Competitions are regularly organized on various faces of such walls for the climbers to test their skills. Natural Climbing : This is a style of climbing practiced on natural rocks. Usually there are two sects amongst the natural rock climbers : Traditional & Aid climbers. Aid climbing is done by repeatedly placing and weighting gear in order to actively aid the ascent. Traditionals however believe in only passive support systems like top rope belay. Anchors, ropes and protection are used to back up the climber and are passive as opposed to active ascending aids. Bouldering is like a young brother of climbing. Its Climbing on short, low routes without the use of the safety rope that is typical of most other styles. Protection, if used at all, typically consists of cushioned bouldering pads below the route and a spotter, a person who watches from below and directs the fall of the climber away from hazardous areas. Bouldering may be an arena for intense and relatively safe competition, resulting in exceptionally high difficulty standards. Interestingly India has one of the most poplar boulders in the world in Hampi. Like climbng, Bouldering is also graded by international standards; Hueco & British being the popular ones. If you are thinking that climbing and Bouldering are just hobbies….think again! It’s a well recognized sport across the globe. Many countries host a national championship every year including India. India has produced many world class climbers : Praveen, Ajiz Shaikh, Kumar Gaurav, Sidhi and Sushirani are few amongst those. 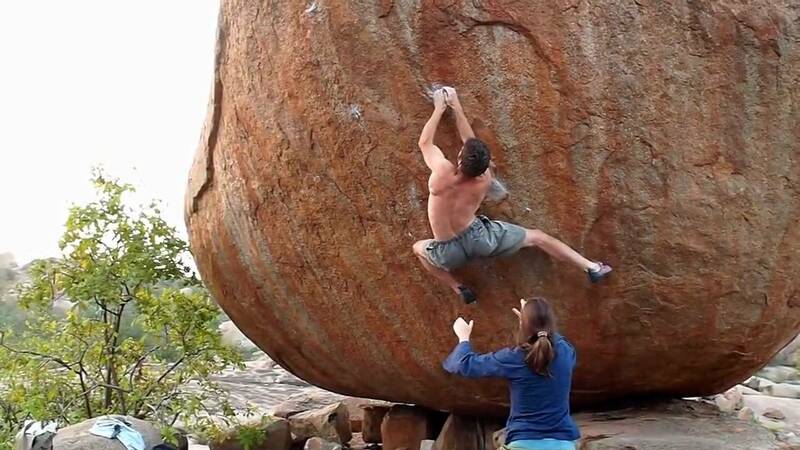 India would be hosting World Bouldering Championship in 2016. Hampi is considered to be the best location for Rock Climbing in india(Karnataka). Hampi is Unesco World Heritage Site and has remains of ancient city of Vijaynagaram. Hampi is visited by the rock climbers from India as well as abroad and offers excellent opportunities in bouldering. Some of the most famous bouldering sites in Hampi are the Hemakuta Hill, Matanga Hill, and the premises of Tiruvengalantha Temple and Malyavanta Raghunatha Temple. Rock climbers can find the largest free standing boulders at Hemakuta Hill. Badami is a famous adventure destination in the state of Karnataka, owing to the presence of red sand stone cliffs that surround the Agastya Tirtha water reservoir. These sandstone cliffs have horizontal cracks, which make Badami a favored destination of rock climbers. Rock climbers visiting Badami can go for free climbing (Trad & Sport Climbing) and bouldering. Badami rocks have many multiple routes and more than 150 bolted routes. Adventurous rock climbers, including beginners and professionals, can enjoy rock climbing at Badami. The ease in rock climbing at the sand stone cliffs of Badami has earned it the title ‘the Mecca of Rock Climbing’ among local as well as international rock climbing enthusiasts. 1. Ramjas Rocks Located in West Patel Nagar Delhi. 2. PBG Rocks Located in Delhi Ridge. The area comes under the control of the President’s bodyguard cavalry unit. 3. Lado Sarai old rocks Situated in a park under the control of the Delhi Development Authority . The park is located on the road between the Qutab Minar and Saket metro station. 4. Lado Sarai new rocks located in a park known as Garden of five senses. 5. Dhauj village in Haryana Located about 50km from Delhi and about 20 kms from Gurgaon. 6. Damdama lake rocks: a scenic climbing area by the famous Damdama lake. Other than these options you can also visit IMF ( Indian Mountaineering Foundation ) on Benito Juarez Road, New delhi.IMF has an international standard artificial climbing wall where many renowned climbers from Indian come & practice.